In our information saturated age, it is a fun novelty to come into a film blind. It is an approach that harks back to a time when only the most expensive films were aggressively marketed and spoilers were not readily available, when one could stumble upon a film and be surprised by its contents. Now even the most marginal arthouse film will spend a relative fortune on advertising, in the vain hope of piquing the casual audience’s interest. The sum total of my knowledge going into ‘Get Low’ was that it was a hit on the festival circuit and stars Robert Duvall and Bill Murray. Felix Bush (Duvall) is a hermit in 1930s Caleb County. Shunned by the community, he is a local boogeyman who is the subject of wild speculation amongst the townsfolk. Felix makes a rare trip into town to plan his funeral with Rev. Horton (Gerald McRaney). 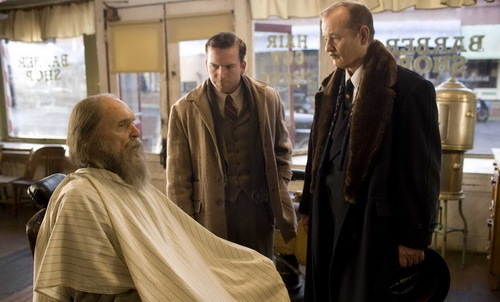 His exchange is overheard by Buddy (Lucas Black), who works for a struggling funeral home owned by Frank Quinn (Murray). Buddy and Frank approach Felix, who asks them to arrange a ‘funeral party’ for him, which will take place before his death and allow everyone to share their stories about him. On this somewhat slender conceit is built a charming, cathartic, elegaic tale spearheaded by a masterful central performance. Duvall connects with the role of the grizzled, laconic outsider in a way he hasn’t since he single-handedly carried ‘The Apostle’ (1997), every gesture and inflection articulating some facet of Felix’s emotional baggage. Murray brings his wounded wit and hangdog charm to a role that could have done with more definition. The character only exists in relation to Felix; which is a shame, as there seems to be a story waiting to be told that Murray could have sunk his teeth into. Equally, Sissy Spacek’s considerable gifts are not fully utilized as Mattie; an old flame of Felix’s who has just returned to town following the death of her husband. Her scenes with Duvall are touching and compelling, but their relationship feels like a narrative device. My only recollection of Lucas Black is from his starring role in the execrable ‘The Fast and the Furious: Tokyo Drift’ (2006); which makes the fact that he is not overawed in the presence of his prestigious cast mates all the more miraculous. ‘Get Low’ is the debut feature of Aaron Schneider, who was a cinematographer for thirteen years before winning an Oscar for directing the short film ‘Two Soldiers’ (2003). Schneider’s photographic background is apparent in the film’s luscious visuals, washing the bare trees, lamp-lit interiors and roaring fireplaces in a warm, earthy glow evocative of the period. The production design is meticulous, but is not a crutch on which to pile all manner of broad totems in lieu of dramatic authenticity; a trap so many period pieces fall into. Chris Provenzano and C. Gaby Mitchell’s screenplay is executed with tremendous economy, though sometimes to the detriment of character development. It thrusts the viewer into an initially disorientating world without the comfort of exposition, taking a Coens-esque delight in the nuances of language. A common thread of ‘Get Low’ is the idea of people running away from their past – be it Felix from his guilt, Frank from his failed marriage or Mattie from her widowhood – and that they can only keep running for so long before this tangle of experiences poisons the soul. It is refreshing to see a film where older actors are not used merely as venerable supporting players, but given substantial parts that call on their vast reserves of experience. Though not without its faults, ‘Get Low’ is an uplifting antidote to the sneering misanthropy of so much indie cinema, apparent in films like Noah Baumbach’s navel-gazing ‘Greenberg’ (2010). Without resorting to mawkish platitudes, ‘Get Low’ posits that we are neither saints nor sinners, but a little of each, imperfect by nature, capable of immense good and terrible evil, that forgiveness is the only cure for a restless soul. Duvall debates whether or not to get cornrows. Before his epochal sequel to ‘The Godfather’ and setting off into the heart of darkness, Francis Ford Coppola had the financial clout to get this self-penned labour of love to the screen. Rewarding their New Hollywood wunderkinds for a string of monster hits, Paramount arranged a distribution deal with Coppola, William Friedkin and Peter Bogdanovich under the name ‘The Directors Company’ – which proved to be a disaster; read Peter Biskind’s book ‘Easy Riders, Raging Bulls’ for the full story. Harry Caul (Gene Hackman) is a guarded surveillance expert whose absorption in his work comes at the expense of his personal life; he is unable to have a proper relationship with his nominal girlfriend, Amy (Terri Garr), and lives alone in a sparsely decorated apartment. Caul is employed by the Director (Robert Duvall) to track two of his employees, Ann (Cindy Williams) and Mark (Frederic Forrest). In the course of what appears to be just another job, Caul unearths a murky plot with dire implications. He is faced with a moral quandary; to maintain a professional distance and hand over the tape of Ann and Mark’s conversation to the Director as scheduled, or heed his conscience and intervene. The complexity of Coppola’s taut screenplay is brought to life by Bill Butler’s chilly, clinical photography; matching the austerity of Caul’s demeanour. David Shire’s plaintive, foreboding score is equally effective in this regard, its haunting piano spirals reverberating through the empty spaces that Caul haunts. Walter Murch’s dense, overlapping sound editing is put to splendid use in the scenes where Caul slowly assembles the tape, expertly mimicking the alchemy of his craft. Coppola’s direction has a focus and restraint that is absent from much of his subsequent work, his shot selections completely in keeping with the tenor of the piece. Caul is seldom seen in the foreground; a conscious decision is made to shoot him in an array of medium and longs shots, to underline his anonymity by submerging him in his surroundings – as well as remind us that we are voyeurs by choice, not profession. Hackman is the film’s lynchpin, turning in a compelling, nuanced performance as far away from the foul-mouthed swagger of ‘Popeye’ Doyle as it’s possible to get; an important stage in his development that dispelled once and for all the nagging suspicion he was little more than a brawny everyman. While propagating the image of a coldly rational loner who ‘doesn’t know anything about human nature’, Caul is in fact an emotionally fraught, short-tempered, thin-skinned man beset by self-loathing, envy and guilt. Hackman perfectly captures this dichotomy, depicting the flawed, tortured Caul’s inner turmoil and transformation with a subtlety that is so often absent from the trite Hollywood third-act ‘epiphany’. ‘The Conversation’ features a glut of adept supporting performances from some of the finest character actors of their generation: John Cazale as the uncouth, lackadaisical Stan, Allan Garfield as Bernie, Caul’s cocksure, combative rival; typically accomplished turns from Coppola regulars Duvall and Forrest and even a brief appearance by a pre-Han Solo Harrison Ford as the Director’s arrogant underling. Coppola’s fascination with Catholic ritual is in evidence throughout; but where those sacraments were used in ‘The Godfather’ as a trope to juxtapose virtuous words with murderous deeds, they are invoked in ‘The Conversation’ to grapple with notions of culpability and absolution. Caul’s outward piety is central to his self-perception; the last vestige of a humanity that has been stripped away by years of subservience to his career. He sees saving Ann and Mark from the nefarious designs of the Director as the ultimate act of expiation, the only thing that can atone for his past misdeeds, and sets about doing so with a recklessness that goes against his instincts. But as with every assignment he takes, he is only privy to one side of the story, lending an uncharacteristic degree of credence to what is captured in the recordings. Metaphor abounds in ‘The Conversation’. 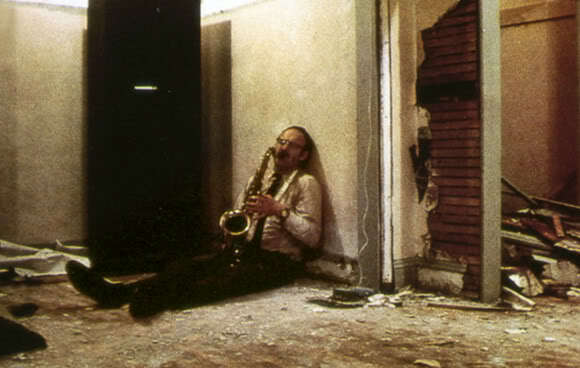 The saxophone Caul plays on his own each evening hints at a side that is hidden from the exterior world; a more expansive, emotional self he has been forced to suppress in order to survive in his chosen field, a thwarted ambition he can never fully abandon. The empty warehouse where Caul works symbolises the single-minded, ascetic shell of an existence he leads; the bus where the lights begin to flicker then plunge him into darkness indicative of a life lived in the shadows. Caul’s intrinsic nature is defined in the scene where the Director’s underling leaves him alone in his office and he immediately makes for the telescope by the window; he is someone who is empowered by watching life from a comfortable distance. ‘The Conversation’ remains an enigmatic, uncompromising highlight of Coppola’s oeuvre; an enduring work of maturity and intricacy; as much a study of spiritual redemption as an exploration of post-Watergate paranoia in the vein of Alan J. Pakula. The film was conceived as the Watergate scandal was raging and released just months before Richard Nixon’s resignation. Of course, it is informed by this unfolding national infamy, but only in an abstract sense, embodying the feelings of cynicism and dread that characterized the Zeitgeist. We can only speculate what could have been if Coppola hadn’t squandered a fortune and succumbed to madness in the wilds of the Philippines shooting ‘Apocalypse Now’; he may have still had the means and the desire to produce films of this calibre on a regular basis. Just another quiet night in for Harry Caul. ‘The Chase’s’ journey to the screen was a turbulent one. This infamous misfire was supposed to be an integral part of producer Sam Spiegel’s legacy, a prestige picture to rank alongside his previous landmarks ‘The African Queen’, ‘On the Waterfront’, ‘The Bridge on the River Kwai’ and ‘Lawrence of Arabia’. But it ended up being a protracted battle of wits between Spiegel, its meticulous writer, highly strung director and capricious leading man; fatally compromised by the egos it strove to appease. ‘The Chase’ was a failure from which Speigel would fail to recover, his reputation for efficiently steering high-profile pictures to completion forever ruined. Hoping to rekindle Marlon Brando’s waning enthusiasm for acting, Spiegel tried to shoehorn as much material into the ever-changing screenplay that would appeal to his star’s social conscience, much to the chagrin of its screenwriter, the redoubtable Lillian Hellman. In ‘The Chase’, a small Southern town is thrown into turmoil when one of its former inhabitants, Bubber Reeves (Robert Redford), escapes from prison. In the course of fleeing, Reeves accidentally kills a man whose car he is trying to hijack. Meanwhile, the town’s embattled Sheriff, Calder (Brando), tries to prevent tensions from boiling over between sections of the town’s denizens, all of whom agree that he is nothing more than a puppet for local oil magnate, Val Rogers (E.G. Marshall). Bubber becomes a mythical figure amongst the town’s youth, and his return threatens to blow the lid off an affair between Roger’s son, Jake (Edward Fox), and Reeves’ wife, Anna (Jane Fonda). It’s difficult not to compare ‘The Chase’ to a film directed by Penn a year later. By going back to the ‘30s, Penn was able to make a much more radical statement about ‘60s ferment with ‘Bonnie and Clyde’ than he ever would have been permitted to under the aegis of the tyrannical Spiegel. There are signs of this bravura in some of the set-pieces, but ‘The Chase’ feels staid by comparison. One of the few areas in which the film does excel is its cinematography; Joseph LaShelle captures a sultry Southern summer with aplomb. Away from the chaos of the shoot, the second unit was given a degree of latitude and captured some striking scenes of Reeves’ escape, injecting some excitement into the largely laborious opening act. In hindsight, many of the film’s other problems could have been ameliorated before the project was set in motion, had all the forces guiding the film been pulling in the same direction. Redford is wholly unconvincing as the rugged con on the lam. Although his legendary screen persona had yet to be formed, he is just too inherently clean cut and suave a figure to be plausible and elicit sympathy for Bubber; there is no suffering on his face or privation in his voice. Equally, English actor Edward Fox was a strange choice to play the disillusioned scion of an oil empire, a casting blunder that was never reconciled. His on-screen relationship with Fonda is fatally stilted; the pairing come across as two actors with incompatible approaches struggling to make sense of the muddled material given to them. Fonda – whose acting here is as embarrassingly earnest as that of Bree Daniels in ‘Klute’ – gamely strives to invest her character with an inner life, but she wasn’t a gifted enough actor at this stage to overcome the script’s limitations. Brando looks tired and pudgy, his accent alternating wildly – a portent of his unintentionally hilarious, scene-sabotaging turn ten years later in ‘The Missouri Breaks’. His trademark mumble slowly winds down into a barely audible groan, as if resigned to the fact that he was participating in yet another dud. Angie Dickinson is required to do little more than look pretty and not fall over the scenery as Calder’s wife and Robert Duvall is as reliable as ever as Rogers’ henpecked VP, a man trapped between the strict conservatism and growing permissiveness of opposing generations. 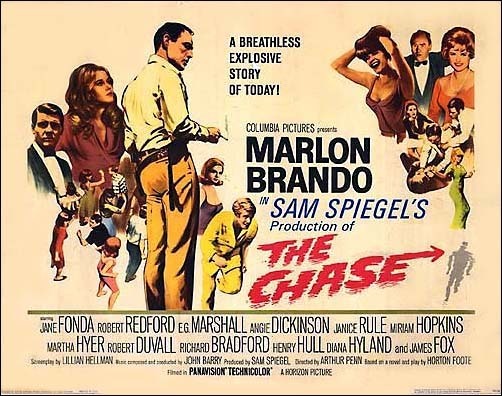 ‘The Chase’ is symptomatic of many films that emerged in the wake of the Kennedy assassination, articulating a deeply ingrained mistrust of the South and its culture – the South of ‘The Chase’ and countless other films through the ‘60s is a feral, retrograde place in danger of being overwhelmed by its own reactionary, inflammatory machinations. Reeves is a patsy who is playing for the town’s sins, with only Calder, a man of solid liberal principles, to protect him from the baying mob. ‘The Chase’ was a vehicle for Brando to promulgate his political beliefs – his decision to commit to the film was made on this understanding – but in setting out to encompass as many of Brando’s favoured causes as possible, the film ends up fudging its approach to each. ‘The Chase’ says nothing about race relations that wasn’t said with greater clarity in ‘The Defiant Ones’ and ‘To Kill a Mockingbird’, and would be dealt with to great acclaim a year later in ‘In The Heat of the Night’. What began as the crux of the narrative is only alluded to, used as a plot device to propel the love triangle that ends up taking precedence over the film’s noble intentions. Who knows, maybe the film would have been a more effective plea for racial tolerance if Bubber Reeves had been played by a black man? Great poster, shame about the film.